New Year’s Eve 2011 last Saturday turned into a special night for Bemidji State goalie and senior captain Alana McElhinney. She had 16 saves in Bemidji State’s 3-2 road win over Robert Morris and her brother, Curtis, had 28 saves for the Phoenix Coyotes in a 4-2 win over the Minnesota Wild. McElhinney checked her phone for updates after the game to see how her brother was faring in St. Paul. Alana and Curtis share similar roles as backup goalies. The youngest of four siblings, Alana was inspired to become a goalie growing up in Calgary by watching Curtis play the game. She also followed the college hockey route like Curtis, who was an All-American for Colorado College in the Western Collegiate Hockey Association. Known as ‘Mac’ to her teammates, McElhinney came to campus as part of the 2008 freshman class with goalie Zuzana Tomcikova looking to replace graduated two-year starter Emily Brookshaw. Tomcikova, the Slovakian national goalie, earned the starting role from the outset. Playing backup to the Olympic goalie has been a positive experience for McElhinney and the two goalies are friends. McElhinney competes with Tomcikova to be the starter each week at practice and waits for her chance to step in and help the team when game day arrives. Tomcikova holds Bemidji State’s career record for wins (35) and is on pace to break Brookshaw’s school records for games played, minutes played and career saves. She feels McElhinney’s value to the team goes beyond what she contributes on the ice. 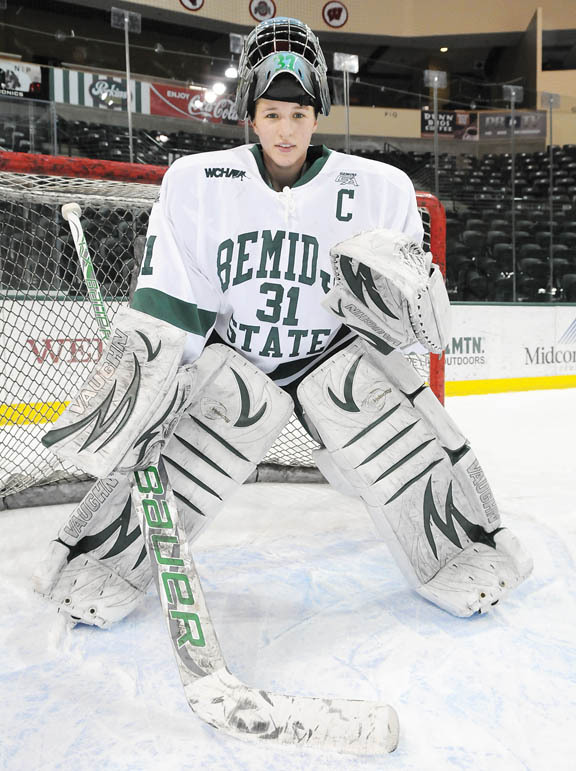 McElhinney may be the backup, but she has the talent and has delivered some big wins for Bemidji State. When Tomcikova was playing at the Vancouver Olympics in 2010, McElhinney had 36 saves to shut out then No. 9 Wisconsin 2-0 on the road in Madison for her first BSU victory. She had 56 saves against then No. 1 Mercyhurst in a 5-3 BSU win in October 2010. The Mercyhurst win marked Bemidji State’s first win at the Sanford Center, the first win in program history over a No. 1 opponent and put McElhinney fourth on BSU’s list for most saves in a single game. McElhinney has played in 34 games and started 24 games in her BSU career. Her time arrived again against Robert Morris and she came through in her fourth start this year to stay undefeated. The win capped a weekend sweep of the Colonials for the No. 8 ranked Beavers. Bemidji State (12-7-2, 6-7-1-0 WCHA) begins the second half of the WCHA season Friday and Saturday at the Sanford Center against Minnesota State University, Mankato. McElhinney said the Beavers are out to prove the national ranking is not a result of ‘luck’ in the second half of the season. The Beavers remain a team fighting for respect in the WCHA the way McElhinney sees it.